Your Healthy Paws Pet Insurance policy has a fifteen (15) day waiting period after your policy effective date for accidents and illnesses. Your policy is effective 12:01 a.m. of the day following the date you enroll your pet. Hip dysplasia coverage is provided at no extra cost and is subject to a 12 month waiting period for pets younger than six. At this time, we are unable to cover hip dysplasia if your pet is six years of age or older at the time of enrollment. Unfortunately if your pet is sick or injured during the waiting period, it is not covered and is considered a pre-existing condition. We have waiting periods to protect all our customers from fraudulent claims. Some people try to have pet insurance pay for an already sick or injured pet and that wouldn’t be fair. For pets younger than six years old, have you seen your veterinarian within the past 12 months? If yes, there is nothing more that you need to do. 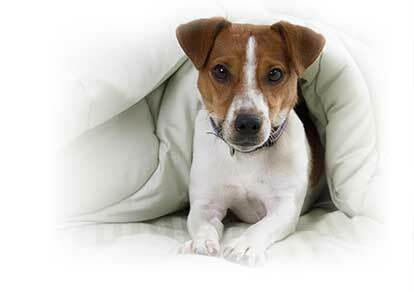 For pets six or older, have you seen your veterinarian within the past 30 days? If yes, there is nothing more that you need to do. If you answered "No" to the above questions, you'll need to schedule a standard veterinary examination within 15 days for the policy to be effective. When you file your first claim, we will need a copy of your pet's full medical history, including documentation of the enrollment exam. You can request this from your veterinarian and have the animal hospital fax or email the records to us. If we do not receive your pet's full medical records, it may delay the processing of your claim.